There is no movie so bad it can’t be at least partially redeemed by Denzel Washington. 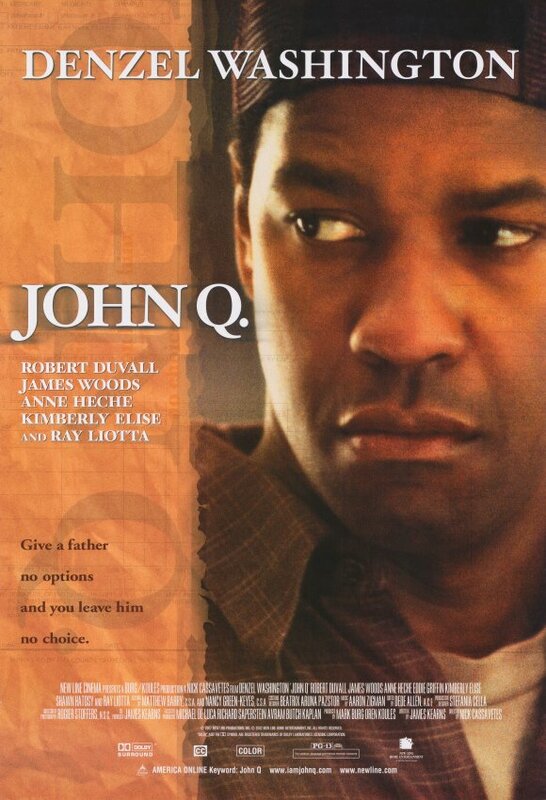 Take John Q. The film is an extremely timely thriller about health care and the difficulties faced by those who cannot afford it, but it is also one of those shamelessly manipulative social dramas in which nearly everything is treated as an opportunity for the filmmakers to ram their messages home. John Q sounds far too many false notes to work as art or entertainment, but there is one thing in it that has the ring of truth, and that is Washington’s heartfelt performance in the title role. The producers clearly have a political axe to grind, but Denzel, at least, manages to bring that kind of conviction to the story itself. John Q. Archibald is a blue-collar family man who is struggling financially from the first moment we see him; he has been working reduced hours at the factory, and his wife’s car has just been repossessed. Then his nine-year-old son Michael (Daniel E. Smith) collapses in the middle of a baseball game. It turns out Michael will die if he doesn’t get a new heart soon, but the emergency transplant costs hundreds of thousands of dollars, and John’s health insurance won’t cover the operation. John sells everything he owns in a vain attempt to raise money for the surgery, but it just isn’t enough. Then he gets an angry phone call from his wife Denise (Kimberly Elise), who tells him that the hospital is about to send their son home, to die. Denise demands that John do something — so he takes a gun and some chains down to the hospital, locks the emergency ward’s doors shut, and takes the staff and patients hostage. From that point on, the film, directed by Nick Cassavetes from a script by James Kearns, follows a familiar pattern. Robert Duvall plays the veteran hostage negotiator who believes he should earn John’s trust and try to talk him out of this predicament, and Ray Liotta plays the flashy police chief who thinks they ought to send in a SWAT team, and the shouting matches between these two men are among the laziest and most amateurish in recent memory. Reporters arrive on the scene too, of course, and when John’s best friend is interviewed by one of them, he does not talk like a real person; instead, he rattles off a string of cliched sound bites. The film has many other flaws, too, from the arbitrary changes of heart that come over certain characters whenever it’s convenient to the plot, to the glib manner in which the script tosses off references to a checklist of other social issues, such as gun control and free trade. One is inclined to cut the film some slack for its seemingly positive portrayal of religious faith — John, Denise, and their friends are shown to be active members of a supportive, racially-integrated church — but even here, the film’s messages tend to be more facile than anything else. Should people facing a social injustice take the law into their own hands? John Q would seem to condone that idea, and what’s more, in one of its overly calculated subplots, it even seems to indicate that John’s desperate action has God’s blessing. John says he’s waiting for an “act of God”, and when it seems that a heart might be available, the film goes out of its way to assure us that the donor deserved to die. But apart from one character’s quickly-dismissed suggestion that John should “let go and let God,” the film makes no attempt to show how faith might help people to cope with their suffering, or with the inevitability of death. The film’s climax is awkwardly contrived, as though the filmmakers wanted to yank every last tear out of the audience while leaving us moderately happy. It ends in a series of clips from late-night talk shows, because as you know, that’s where you have to go to find any meaningful discussion around these issues. It’s a shame the movie itself isn’t so helpful.